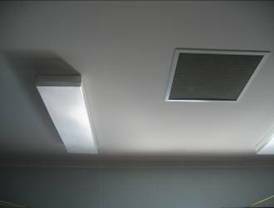 As part of the Victorian Schools Lighting Demonstration sponsored by Sustainability Victoria light guiding shades (LGS) were installed at Huntly Primary School, Huntly, Victoria as illustrated below. Fig 1 Exterior view of light guiding shades. Fig 2. Interior view looking towards shades Fig 3. Distribution of light on the ceiling. 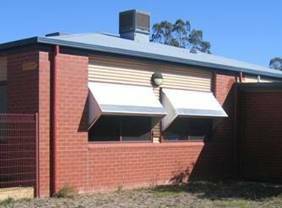 ADVANTAGES IN SCHOOLS : The heating load in school classrooms in summer is high so, generally, classroom windows must be shaded to reduce radiant heat gain. Usually external or internal shading drastically reduces the natural lighting and electrical lighting is necessary. However, light guiding shades accept a fraction of the incident sunlight and guide it through the shade itself into the room so that the sunlight is diffusely distributed over the ceiling. If the ceiling is white most of this natural light is reflected down to illuminate the interior. 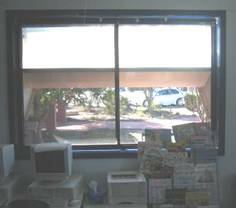 As indicated in Fig 1 above the input area at the leading edge of the shade is about one tenth of the window area. This relatively small area, in direct sunlight, admits plenty of light. However, it does so in an optimal way so that it is distributed deep into the room rather than falling on the floor near the window. The light is emitted upwards, so that the luminance of the light source as seen from inside is low - about the same as the luminance of the view through the window under the shade. Thus the light guiding shade provides optimal shading AND optimal natural illumination for school buildings in a single device. COMPARISON WITH LIGHTING PROVIDED VIA PHOTOVOLTAIC PANELS : Most of the electrical load in conventional schools is due to fluorescent lighting. Some of this electrical load can be generated by photovoltaic panels installed on the roof. This electricity is then converted back to illumination in fluorescent lamps. However, photovoltaic panels convert only about 10% of the incident sunlight to electrical power and of the 36 Watts of electrical power applied to a fluorescent lamp only 10 Watts is emitted as visible light. The other 26 Watts is emitted as heat and IR radiation. Thus the conversion : sunlight to electricity and back to fluorescent light is very inefficient - about 3% efficiency overall. In comparison a light guiding shade distributes sunlight directly into the space to be illuminated. Of the sunlight incident on the aperture about 60% passes through the shade and the window and into the room. As a result of these marked efficiency differences it can be shown that spending money on light guiding shades is about five times more effective in reducing Greenhouse emissions in schools than spending the same money on photovoltaic panels. Given that money has to be invested in some form of shading for windows the cost benefit of light guiding shades is probably much higher. Comment on school application by David Tallis, Sustainability Victoria, Dec 13 2006. I’ve been meaning to drop you a line re the LGS and the successful installation by Gary Griffin and at Huntly Primary School. I dare say Gary has been in contact with you to let you know how thrilled he is with the performance of his LGS’s and that that they have exceeded all his expectations. I have inspected the Huntly installation as part of the close out of our funding under our VSII project and I was also impressed with what the LGS achieved at Huntly. I don’t know if Gary had sent you any photos of Huntly, but I’ve attached a couple that I had taken to show our VSII team following my visit. Would it be possible to fit photo voltaic panels onto the LGS (without covering the clear panel)? I can see this could be attractive to some installations. Is the LGS designed and manufactured specifically for each window IE tailor made to specific dimensions relative to window height etc. If we can get some more LGS’s installed as part of our VSII program, are you able to supply for Queensland fairly quickly? As mentioned in 3 above, you may be contacted by some people who are looking at seeking VSII funding and have indicated interest in the LGS and I have passed on your contact details to them. Also, we intend to write up the Huntly installation as a VSII case study. When I have a draft of the case study I’ll send you a copy for your comments.